As well as representing locally, Hunt Law Firm is willing to travel. William Hunt, Jr. represents clients from Chester, Conrad, Cut Bank, Browning, Valier, Havre, and Great Falls, MT. Hunt Law Firm also represents Canadian clients and interests in Montana. My fee depends on the type and complexity of the matter. I am committed to providing legal representation and counsel at a fee that is fair to a client and myself. Please contact me and I will be happy to discuss a workable fee. My goal is to provide you the best legal advice, documents, and representation possible in a confidential, timely, and accurate manner at a reasonable fee. Bill Hunt is licensed to practice law in all state courts in Montana as well as the Blackfeet Tribal Court in Browning, the Chippewa Cree Tribal Court in Rocky Boy, the Confederated Salish Kootenai Tribal Court in Pablo, and the U.S. Courts Martial. He earned his law degree from the University of Montana in 1998, clerked for the 9th Judicial District Court in Shelby, and founded his private practice in 2000. Bill has experience in many areas of the law including representing the interests of Canadian clients in Montana, municipal and county government, mediation, USDA Rural Development, and areas such as real estate, business, estates, and uncontested family law. He is currently the attorney for the City of Shelby, Montana, Town of Chester, Montana, Sunburst, Montana, and Tri-City Interlocal (Conrad, Cut Bank, and Shelby). 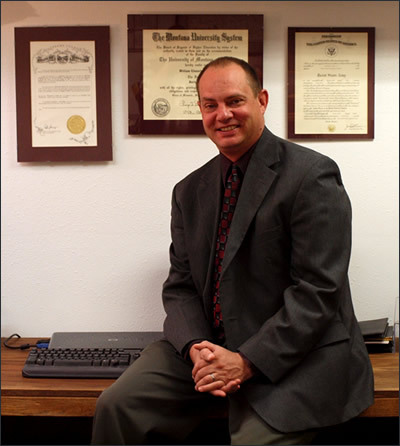 He has extensive trial experience and certified as a mediator through the Montana Center for Collaborative Solutions. Hunt Law Firm, PLLC is located upstairs in the Mercantile Mall Building. Copyright © 2018, Hunt Law Firm, PLLC - All Rights Reserved.